We’re rounding out the weekend with something rather special. This bewitchingly beautiful Ferrari Testarossa is the work of car-building legend Firas Abu-Jaber, and it is – as you can see here – astonishingly good. Firas’ spectacularly presented creation is 100% LEGO (those excellent rims are genuine LEGO pieces that have been custom chromed) and includes a superbly detailed engine and interior inside the opening engine cover and doors. There’s much more of Firas’ Ferrari to see at his Testarossa Flickr album by clicking here, and you can read our interview with the man behind the model by clicking here. Anyway, the models! These two superb Speed Champions style Ferraris are the work of Jonathan Elliott of Flickr, and he’s done a thoroughly good job of recreating the mid-’80s Testarossa and mid-’70s 512 BB in 7-wide(ish) form. If you fancy a closer look click here for more of the Testarossa and here for more of the 512 BB, and if you’re an international reader and you don’t know what an Essex accent sounds like click here and brace yourself count yourself lucky. Constructed from around 36,000 pieces and 4 years in the making, this is one of the largest Lego projects that this site has ever featured. Ryan Link, a regular bloggee here at The Lego Car Blog, has been very busy. Loosely based on the Tampa Bay Ferrari dealership, Ryan has designed and built a home for the eight Ferrari models that he has constructed over the past few years. Measuring 192×144 studs, Ryan’s enormous creation can easily house his collection, and features a wealth of incredible detailing, including brick-built wall mosaics depicting classic Ferrari models, beautiful Ferrari lettering, and even a couple of wonderfully intricate prancing horse logos too. The shot above shows just how good the aforementioned mosaics and logos look, which feature throughout the interior of the dealership including in the showroom, customer lounge and accessories area, and workshop, all of which are lit by a third-party LED system integrated into the roof of the build. The stars of Ryan’s incredible build are of course the Ferrari models which it was built to house, and they include a 458 Italia, Enzo, LaFerrari, 599 GTB, Testarossa, F12 Berlinetta, and even a fully liveried Ferrari team truck, all of which have been published here. Ferrari’s flat-12 engined Testarossa was one of the definitive supercars of the 1980s. Named after the red colour of its engine block, it was produced until the early 1990s, when a mild update and a new name kept the platform going until 1996. With almost 10,000 units made, the Testarossa design is one of the most produced Ferraris of all time, and previous bloggee Ryan Link has decided to add one more car to that figure. 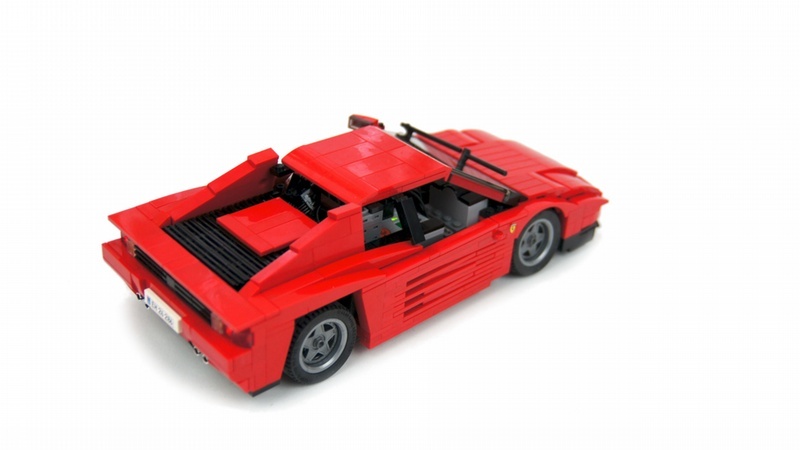 His Model Team recreation of the icon ’80s supercar captures the Testarossa’s shape brilliantly, and opening doors, hood and engine cover reveal an interior and engine that are just as well detailed as the outside. There’s more to see on both MOCpages and Flickr – click the links to view all of the images and build details. This incredible creation comes from car-building legend, TLCB Master MOCer, and all-round nice guy Firas Abu-Jaber. It is of course the bewitching Ferrari Testarossa. Firas makes his return to TLCB with several versions of the iconic Italian super car, including the original 1980s incarnation, the later 512 TR, and a spider variant. The Testarossa launched in the mid-80s with a mid-mounted 4.9 litre flat-12 engine (necessitating the car’s enormous signature side vents), and over 10,000 were built across all variants until production ceased around a decade later, making it one of Ferrari’s all-time best selling models. Fires Abu-Jaber’s stunning replicas of the quintessential Ferrari recreate every detail in breathtaking realism, and he’s thrown in some unique building techniques too, including the ingenious use of LEGO magnets to attach the rear bodywork and engine – a technique we expect to see used throughout the online community before long. There’s a huge gallery of images available to view, including ‘how-to’ shots of that cunning magnetism, on both MOCpages and Flickr – click the links to see all the photos, plus you can read Firas’ interview here at TLCB by clicking here. Ferrari’s Testarossa is possibly the car that defined 80’s excess, and as fashion moves in circles it’s starting to look very cool once more. This neat recreation of the famous Fezza has been built by Sariel, who is – as many of you will know – one of the very best Technic builders in the world right now. So what’s this admittedly pretty, but simple static model doing coming from him? Well, almost unbelievably, this little Ferrari features a complete Power Functions remote control system inside along with working lights front and rear. To fit it all in Sariel has designed one of the cleverest steering systems we’ve seen, which allows the front wheels to pivot inside their arches. 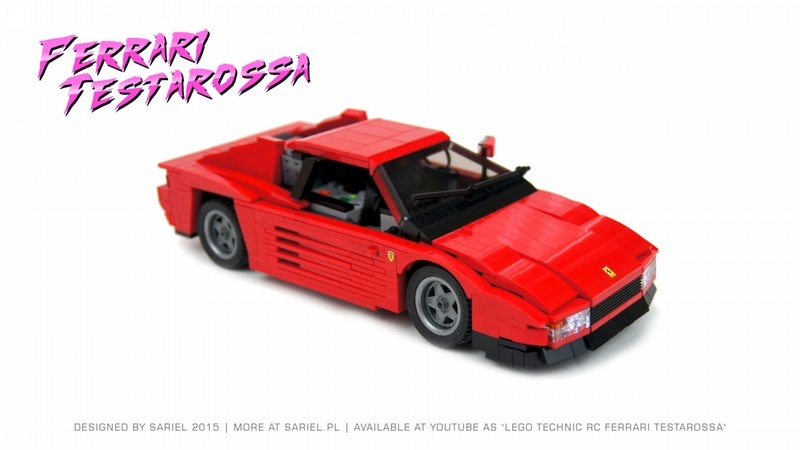 You can see how’s he’s done it via MOCpages, where there’s also an excellent (and nostalgic) video showing the Testarossa in action, and you can read his interview with us here at TLCB by clicking this link to the Become a Pro series. Before Ferrari became a marketer of expensive yet pointless merchandise* they made cars. Cars like this one, the glorious 1980s’ Testarossa. Featuring the firm’s last flat (boxer) engine the Testarossa produced just under 400 bhp from its twelve cylinders, and almost 10,000 were made during an extensive 12 year production run. This brilliant Lego replica is the work of TLCB debutant Lennart C, and he’s employed some rather unique building techniques to recreate the ’80s icon. You can see all the photos of Lennart’s Ferrari on Flickr at the link above. *If Ferrari’s notoriously trigger-happy lawyers are reading this we don’t mean it. ** Please don’t sue us. **We do. But still please don’t sue us.